Wilca Sauveterre is committed to living a life led by the Holy Spirit. Sauveterre is one of 46 men and women who made formal commitments in 2018 as Associates of the Dominican Sisters of Peace. As Associates, these Christian men and women have chosen to share in and live out the preaching charism of the Dominican Sisters of Peace by striving to live a life of peace-making wherever they are and in everything they do. 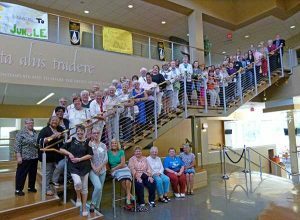 Associates of the Dominican Sisters of Peace gather for a group photo at the Congregation’s 2018 Assembly. Jim Layden, of Columbus, OH, said he initially felt a connection to the congregation more than a decade ago when he began developing relationships with some of the Sisters as an employee at Ohio Dominican University. Before Associates make an initial two-year commitment, they journey through a discernment process, which typically takes a year. The process generally includes prayer, study of a guidebook, relationship building, and a discernment retreat. Each Associate Candidate is companioned by a Sister and/or Associate. Like Layden, Marlene Kasama, of Bardstown, KY, was drawn to the community of Dominican Sisters of Peace via her relationships with Sisters at the Motherhouse in St. Catharine, where she works. It was the love expressed by Sisters in Colorado that motivated Victoria Ortega to seek more information about becoming an Associate. Ortega, of Denver, said the care that she received while mourning the loss of her father produced a desire to learn more about the congregation. “I was moved by the patience and care that they showed me, but I was also touched by the care they showed for one another,” Ortega said. “I wanted to be a part of them. I wanted to be connected to them. Ortega, Kasama, Layden, and Sauveterre all agree that being an Associate means living a life that is dedicated to building a more peaceful world. There are nearly 700 Associates of the Dominican Sisters of Peace worldwide. The 2018 class included one Associate in Puerto Rico; four in Louisiana; six in Kentucky; five in Kansas; four in Tennessee; one in North Carolina; four in Michigan; and 21 in Ohio.